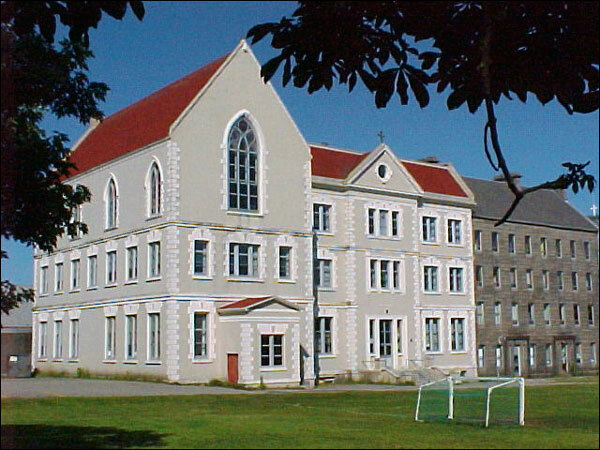 St. Bonaventure's College, (St. Bon's), designed by James Purcell and built by Patrick Keough, is one of St. John's most recognised educational facilities. St. Bonaventure's College, one of the earliest collegiate schools for Roman Catholic boys in St. John's, is an example of the Gothic Revival style of architecture. In 1855 there was a public auction to sell more than 30,000 building stones from Waterford, Ireland, which had been imported to build the local penitentiary. Catholic Bishop of the day, Right Rev. John Thomas Mullock, took advantage of plans to build a smaller penal institution and purchased sufficient surplus stones to construct a Franciscan monastery. In April 1857 the bishop laid the cornerstone of the college named after the Franciscan Order's most scholarly and famous theologian, St. Bonaventure. A year later, in March 1858, the new facilities opened. Dormitories were installed upstairs as the institution operated as a seminary. Seven years later in 1865 the college began to admit secular students and, in 1889, the Irish Christian Brothers assumed administrative responsibilities for the school. Their association with the school lasted 99 years until 1988. St. Bon's reputation and popularity continued to grow and in the early years of the twentieth century the facilities became crowded. In response to the problem, Mullock Hall was built in honour of the bishop responsible for the college. Designed by Jonas Barter and built by M. E. Kennedy, Mullock Hall was completed by 1908. In the vestibule of the extension there is a memorial bronze plaque erected to the memory of former St. Bon's pupils who died in the First World War. Some of Newfoundland's political and cultural leaders were educated at St. Bon's. Among its graduates are many Rhodes scholars, Jubilee scholars, two lieutenants governors, three chief justices, five archbishops and six regular Bishops. The first Newfoundland Rhodes Scholar, Sidney Herbert, was a St. Bon's student. In addition, Newfoundland prime ministers Sir Edward Morris and Sir Michael Cashin were both St. Bon's alumni. The school was also a perennial leader in sports and was the first educational institution to institute an annual sports day. The prestigious Boyle Trophy has a long association with the school. After the introduction of a new high-school system in 1962, St. Bon's was relegated to the status of a grade school. It continued in this capacity until 1998 when the school was closed as a part of the Newfoundland government's school reform measures. In 1999, it was re-opened as a private Catholic School. In May 1989 the Heritage Foundation of Newfoundland and Labrador designated St. Bonaventure's College School a Registered Heritage Structure. Also view the St. Bonaventure's College (Mullock Hall) Registered Heritage Structure on the Heritage Foundation of Newfoundland and Labrador web site. The Newfoundland and Labrador Heritage Web Site has on its site only a portion of the registered heritage structures in Newfoundland and Labrador. To view a complete list or search for a particular structure visit the Heritage Foundation's Property Search page.